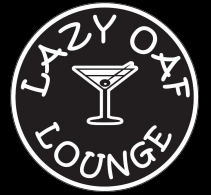 The Lazy Oaf Lounge is Madison’s eastside place for friends and family to hang out in a fun, laid back atmosphere. Besides relaxing in our cocktail lounge and, in nice weather, outside on our large patio, you’ll enjoy great food from our restaurant including pizza, burgers, sandwiches, salads and appetizers. We also feature nightly entertainment, including free live music on Saturday nights, Karaoke, and America’s Pub Quiz.